Előrezgések 3 – A Funny Fools Story. Beatles – said Peter Buchberger. Or he might have said it so: Bitls. Which was more or less correct. After all we were both freshmen highschool students in a class that had English as a major. (For Peter, the second time). So, he was a relative senior, sharing a desk with me. He knew what was going on. And what really was going on, according to Peter, was the Bitls. They were the new thing, the big thing. The real thing. England was on her knees and young people went crazy. Real crazy, like losing it …are you getting this, Gaby? The conversation we had been having took place on King Street, the penny lane of our corner of the world, walking home, like we did every day, straight from the high school we attended at the east end of Kiraly Utca. 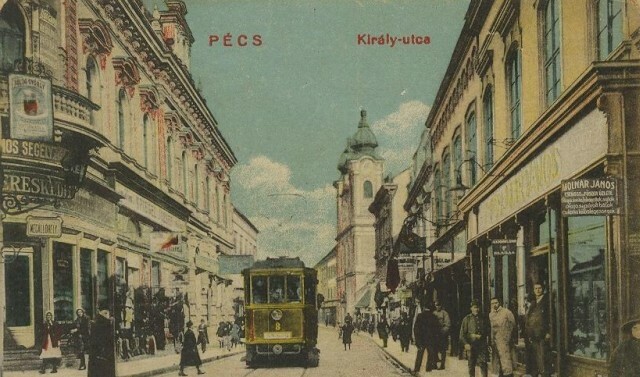 Main Street (Kiraly Utca – King’s Street), late 1930s. The point was to decide who likes what band the most. For we were at the age when these things suddenly acquire disproportionate importance. I was being most impressed with the Spotnicks. They were awesome. I’d been already playing Amapola – or at least making a good attempt at it, but Orange Blossom?…Orange Blossom! That sound! That technique! How could they even play that?.. And now Peter says it’s the Bitls. I’d better pay attention. Here I was, at 16, the budding young guitar player and I hadn’t even heard of the Bitls let alone their music. So how is it? The music I mean… Peter didn’t sound too convincing: it’s better than anything. How is it so good? Peter couldn’t answer that. But I knew at that point that it was something profound and glorious, something that will sweep me off-and-away for the rest of my life. It was a premonition. Supernatural. The next days I spent turning the waves upside down and inside out on every radio set I could get my hands on in search for Beatles music. And those radio waves were a mess. And I couldn’t understand the announcers. Despite the year I’ve completed with my English grades all A-s I still couldn’t make out what Radio Luxembourg DJs were blabbering. Nobody could. I must’ve stumbled across Beatles music in the vast radio space mostly made up of static and interference but I didn’t know if I did; I had no reference. And boy, were those waves a mess! In this frustration one dubious hope remained. An almost-miracle. And it happened. To everyone’s greatest surprise State Radio Petofi (largely corresponding to BBC 2) made a slight political mistake and announced the formal introduction of The Beatles’ first LP. We were glued to the radio, every self respecting young boy and girl in the nation. The broadcast was clear. Un-jammed. And the music was…great. Different…So different that we’ve all lacked the foundations – both musical and cultural – to be fully able to appreciate it. An almost-disillusionment. It left us wide-eyed but un-satiated. Uneasy, restless. Projection sublime: a big warm wave, seductive and shiny was coming towards us over the Iron Curtain to deliver us to worlds colorful and happy and free. In the music I didn’t yet fully understand there were qualities, tender messages that were to trigger two basic emotions: one for the need to cry and one to scream. Please let your visit be known. Like, in a comment. Thanks. This will shock you. It should. 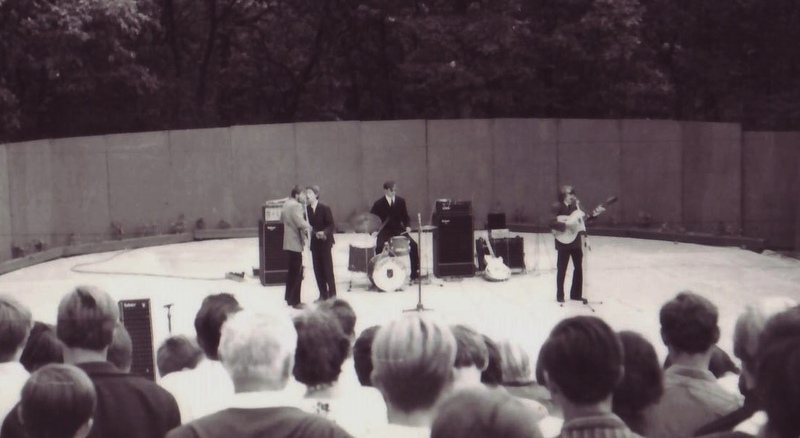 The most unique, outstanding “beat band” (East of The UK, of course) in continental Europe, in the years 1965 and 1966 didn’t come from Sweden. Or Denmark. Nor from The Netherlands or Germany. They came from behind the Iron Curtain, namely, Hungary, of all places. Their name was The Funny Fools. 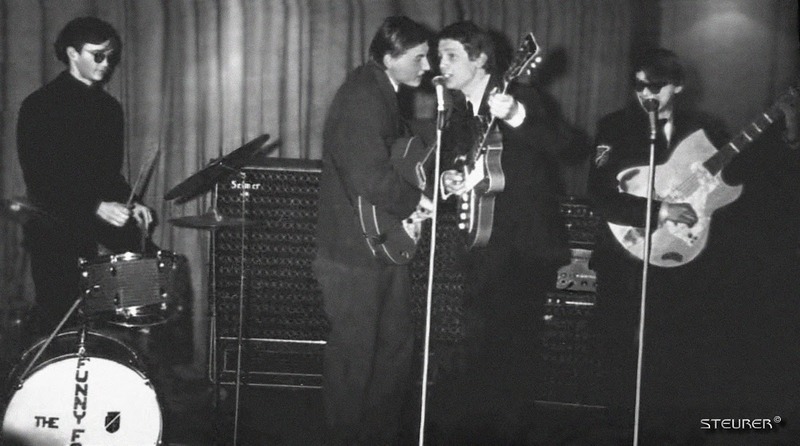 For 1965 and 1966 the „Europe’s Greatest Sixties Band” title (East of Great Britain), belongs to The Funny Fools – a young group from Hungary. Taking the totality of original material as prime determining factor, this is the truth – however unbelievable. Are you screaming the outrage of denial yet? If not, please do so now, because, after reading this story you will do just the opposite. But how come nobody has any of their records? The answer is simple: the oppression system of the time and place killed the band instead of promoting it. (It was the political system and mentality typical of East European Socialism that Paul Gábor, the book’s author, its central figure and leader of the band, dubbed as “Stupialism”). Exposure and popular success achieved by their own, supposedly obedient and communist, rock band in the decadent West would’ve become uncontrollable so they silenced their most promising young band. (Partly, because it might’ve provoked their master, the Soviet Union). So powerful was the message of the music and times of The Funny Fools. (And only the irresistible antics of the band are funny; the music is refreshingly new and different, often solemn, sometimes heavy and politically charged; and that from a group with the average age of less than 20). This whole scenario is simply unfathomable to the uninitiated – like an average British music fan well versed in the Sixties, but “only as we know it”. Is giving such a prestigious title to an unknown (because unexposed) Hungarian band audacious? No band has ever achieved serious rotation in West European radios or record stores sales from those “commie” countries. 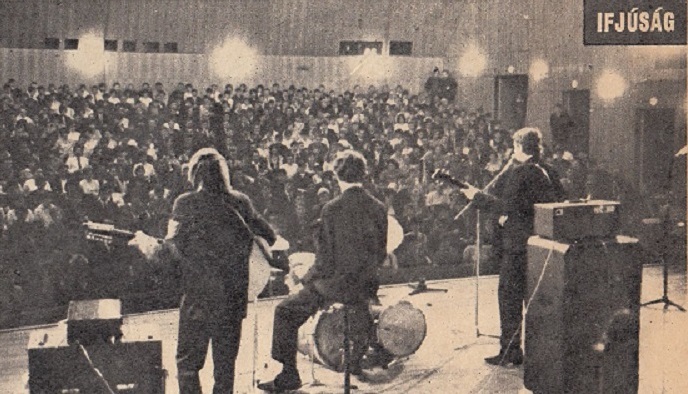 But the fact is that when The Funny Fools introduced their first album in the form of live performances, featuring 12 original and unique, songs in English in the fall of 1965 in Hungary (and followed with their equally unique second album in the same year), only three bands in all of Europe played original music, short in numbers and own style. True, these were also original compositions; the groups were good, but mostly styled after known British bands. This is totally different with The Funny Fools: the method of applying the irrefutable uniqueness of Bartok to classical music is how we have to compare The Funny Fools to the few original European bands of the time, or even to the British Invasion to some extent. The music, the mindset and Beatle-like personalities of The FF stands out, stands apart and holds its own ground. But indeed, there were no Funny Fools records in the stores those days. How so? What would have been unthinkable in any West European democracy was a routine deed in East Europe: oppressive politics and sheer Stupialism have blocked The FF’s ascension to the top. “How could this be?” – you revolt. Check this out: there’s was only one record company in each Stupialist country; all were Government owned and controlled, and if they so decided, even their topmost bands would be denied access to their studios and thus any chance to wider recognition. (But tickets to remote archipelagos were readily available…) And The Funny Fools was an outstanding casualty of this transgression. The band, however, couldn’t be prevented from playing their revolutionary music out, live and loud. The above statements cannot be negated: their music was captured live – though most of these recordings are stone-age quality. (Note: even in England and the USA, many great bands’ live recordings from those early years are unenjoyable because of the subpar recording technology available). But you can tell the FF’s music from miles away, no matter how bad the tape is. You can’t refute it. You can only understand the real, beastly nature and workings of Stupialism. It feared (with reason) the irrepressible power of rock music – and sought to crush it. In the end the exact opposite happened: rock music brought down the Berlin Wall. But there is a “golden sheen over the bleeding” (quoted from a FF song). Since the raw live tapes survived, the will and perseverance of the band’s founder finally yielded a sensational and unparalleled product: the authentic reproduction of the band’s music and spirit in modern-day recordings titled “The Funny Fools: Resurrection”. A thing like that can only be loved – and loved with full abandon. Better late than never? Hurry… (If you know what I mean). Drop your indoctrination and get ready for something fundamentally different. And possibly not as good as the best contemporary British bands. But we need to use a different yardstick of judgement for such a different music from such different circumstances. Though it shares many elements with fellow sixties’ artists, it does that, well… differently. Like the crème de crème of the rock world it rides on their own unique components and arrives at a different landscape. Now, hold onto something firm to survive the shock: it’s not blues based. “Impossible” – says the imprint in you – “it can’t be good than”! Perhaps you are biased? (Movie: “How Rock Brought Down The Berlin Wall”).